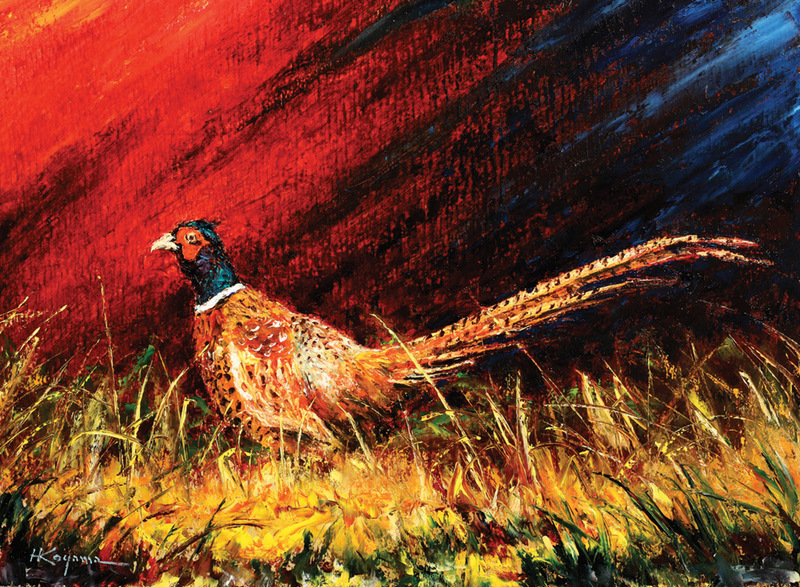 Eight colors plus one palette knife equal an infinite array of possibilities for Harry Koyama. By stripping down complicated elements he allows his subjects to reveal themselves in his paintings. By eschewing the details, Koyama allows the viewer to fill in the missing parts with their imagination. He provides the prompt. We provide the subtext. Which is not to say that Koyama’s paintings lack specifics. On the contrary. He bases his paintings on photographs he takes, mostly in Yellowstone National Park. 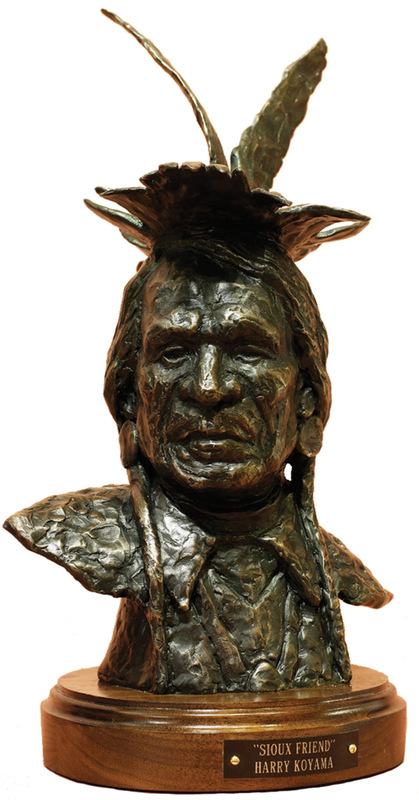 His studio, located in the rear of his Billings gallery, is clean but not sparse. Birch plywood, Koyama’s choice for a painting surface, sits on two of his easels, both in mid-process. Koyama sketches with his palette knife, getting a detailed outline of his subject to work from. 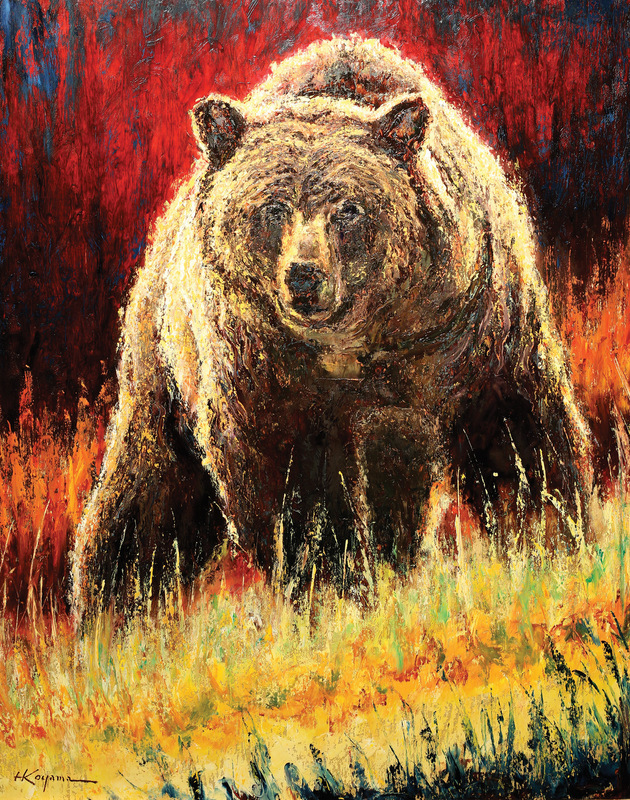 In this case both paintings depict grizzlies. One is a single portrait and the other is a mother with her cubs. Even with only a single color on the board, emotions spill from the piece. The mother watches her cubs — somehow seeing both of them with a single glance — and the cubs look out to the viewer. A portrait in parenting, love and independence. Colin Matthews, owner of the Creighton Block Gallery in Big Sky, Montana, represents Koyama’s work. Not easy for someone whose Japanese-American family was interred during WWII. Koyama reaches for the alizarin crimson, one of the eight colors he uses. The tube of paint, inserted into a caulking gun, hangs along with the seven other colors around the edge of a 5-gallon bucket at his side. With two clicks of the gun, he replenishes his paper palette. The rhythmic metallic ring of his knife against the hardwood as he works on his trademark background provides the backdrop for Koyama’s energetic style. The vivid red of Alizarin Crimson allows the main subject to jump from the surface. Another click from the caulk gun as he mixes ultra marine into the red to darken it. His knife scrapes along the surface, and then quiets into a soothing motion. Above his board is a copy of a smaller version of the grizzly he’s working on. 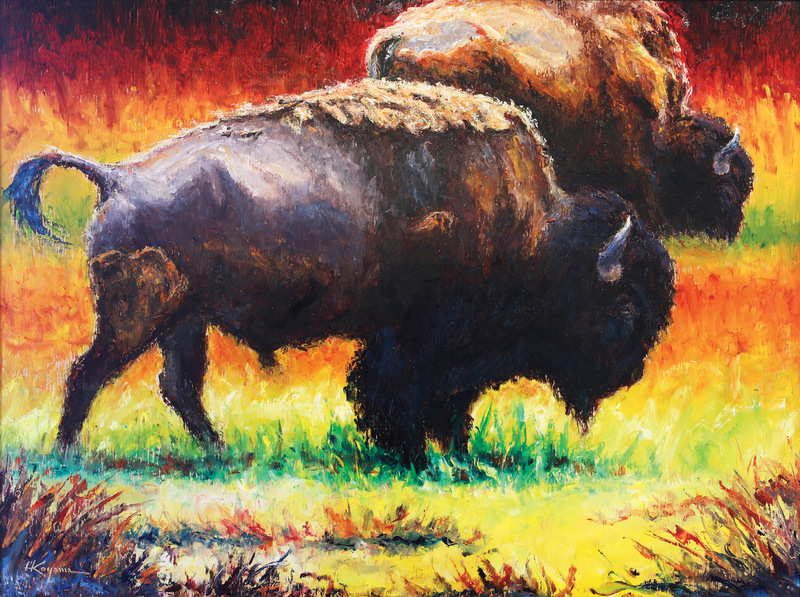 Earlier this year, one of his bison paintings was chosen for the U.S. Embassy in Beijing by former Montana Senator Max Baucus when he was appointed as ambassador to China. 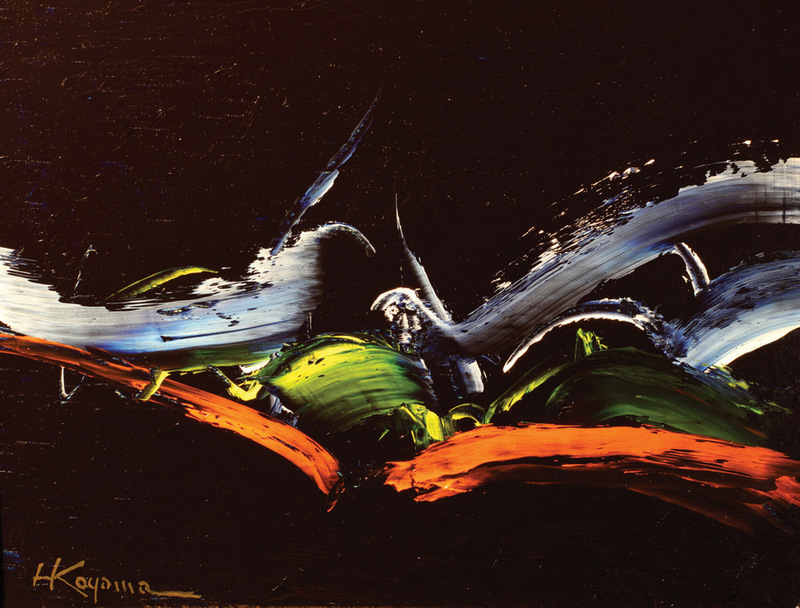 Baucus was familiar with Koyama’s work through the Rocky Mountain College fundraiser where Baucus purchased one of his paintings a few years ago. Deborah Kline Sonderman, director of the non-profit Carbon County Arts Guild and Depot Gallery in Red Lodge, has shown Koyama’s work for more than ten years. 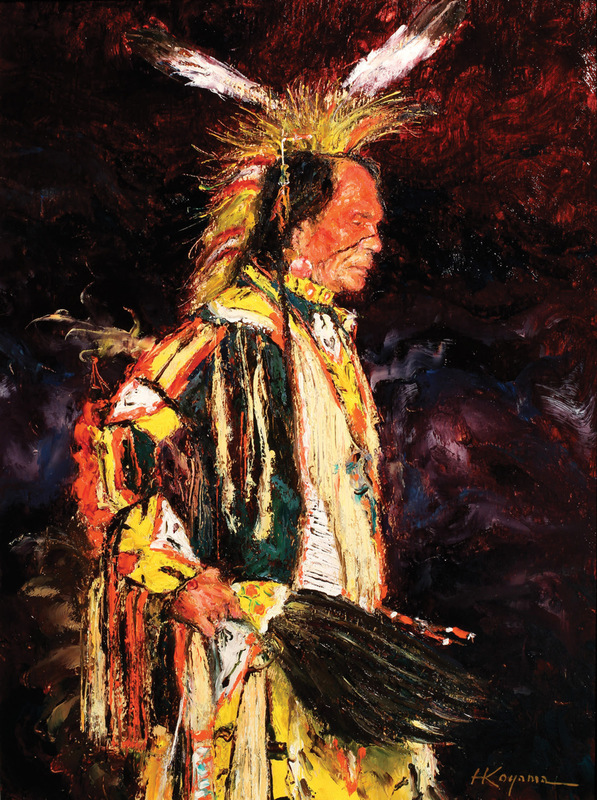 He was their signature artist in 2009 for the Art in the Beartooths fundraiser that keeps their art programs going. Koyama’s career started out in sculpture, but because of the high cost and huge amount of time it takes to bring a bronze to realization, he decided to concentrate on oil painting, although he still works on bronzes. Because Koyama grew up in Hardin, his Crow friends feel very comfortable with his depicting them for portraits. Their comfort and confidence in him show through in his work. In Sonderman’s estimation, Koyama is the best knife painter she’s come across. But it’s Koyama’s bear paintings that touch Sonderman in a way that other painters don’t. In that way, Koyama brings his portraiture style to his wildlife work. Looking back over the years since Sonderman first came across Koyama’s work in Hardin, she says his style has become more refined. 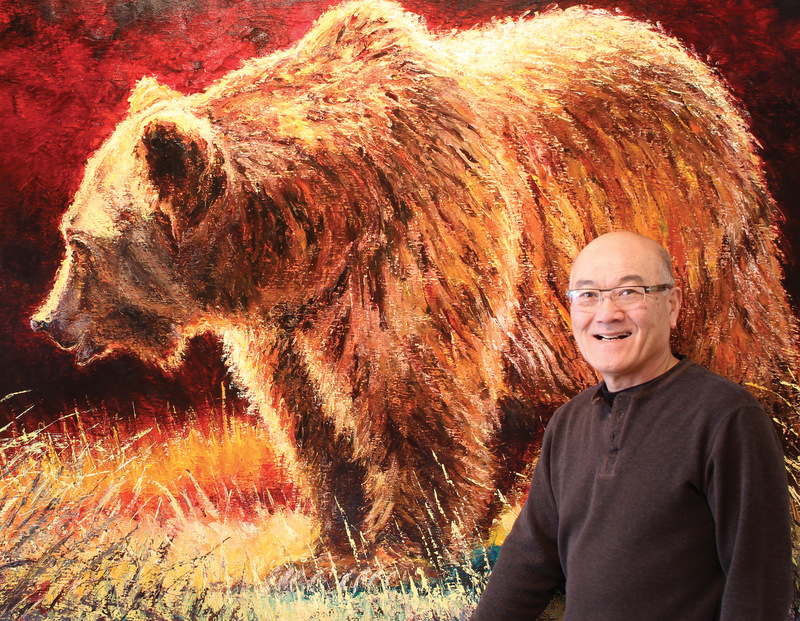 Day Of The Grizzly | Oil | 48” x 72” | The artist stands in front of his painting, Day of the Grizzly.